Inventory We are a resale marketplace, not a box office or venue. Ticket prices may exceed face value. This site is not owned by Oracle Arena . Oracle Arena opened November 9th, 1966 and is home to the National Basketball Association's Golden State Warriors. The Oracle Arena Box Office is currently the oldest venue in use by the NBA. 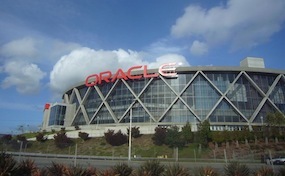 Oracle Arena is located on 7000 Coliseum Way in Oakland, California 94621. Recently renovated in 1997 at a cost of $121 million, Oracle Arena has increased the capacity of Basketball games to 19,596, which is the largest seating capacity for an NBA venue in California. In 1996 the facility underwent a massive $121 million renovation. The upgrades included a new scoreboard, new paint, updated bathrooms and concessions, and new seats. Since the new additions to the venue’s attendance rates have gone up exponentially. The Golden State Warriors winning ways have contributed significantly to the increased attendance. Oracle.ArenaOakland.com is not affiliated with any primary box office or supplier. We are a privately owned and operated business specializing in sales in the secondary market. To buy tickets for any Oracle Arena events in Oakland simply click on the event of interest or call our operators at anytime.